Nainoa Thompson tells us how that, for centuries before European sailors reached the Pacific Ocean, the South Sea Islanders accurately found their way from island to island without the aid of magnetic compasses, sextants or any other navigational equipment. They navigated the Pacific by using their knowledge of natural phenomena such as the directions of the winds and waves, the flight paths of birds, cloud formations and the colour of the sea. Their most important technique however, was the ‘Star Compass’ which was not a physical tool but a mental construct based on their knowledge of the directions that certain stars would rise and set. Such knowledge was acquired over many hundreds of years and passed down by word of mouth and example with each generation committing it to memory. It is a tragedy that because the navigational knowledge and techniques of the early Polynesians and Melanesians were not recorded, they have largely been forgotten or would have been if it were not for the enthusiastic work of Nainoa Thompson, Mau Piailug and others. In modern times, the majority of navigators rely on GPS to find their way although many still keep the traditional art of Astro (Celestial) Navigation alive. How many could navigate the oceans without either of these methods though? Sailor Jerry plans to conduct an experiment by sailing from Fogo Island, Newfoundland (49.8oN) to Mullion Cove (50.02oN) in the British Isles without the aid of GPS or any other navigational equipment, not even a magnetic compass (no jokes about rum line sailing please). He plans to to sail due East along parallel 50oN using only a star compass until he makes landfall, hopefully at one of the following: the Scilly Isles (49.9oN), Lands End (50.1oN) or Lizard Point (49.95oN). Once he has made landfall, he will be able to set a course for Mullion Cove. Jerry is aware that strong ocean currents in the North Atlantic will make it difficult for him to stay on track; at the beginning of his voyage, he will be pushed south by the Labrador and Irminger currents, later he will be pushed east and then northeast by the North Atlantic Current and then he may get caught by the Canary Current which will push him south east. To add to his difficulties, he knows that although the star compass will provide him with directional information, it will not help him to find his position. To overcome these problems so that he can try to stay on track, he plans to frequently calculate his latitude from the North Star by the method explained here. It is likely that he will not have a sextant in a survival situation so he plans to measure the altitude of the North Star using a home made clinometer for that purpose. The method he uses to construct the star compass is simple. Firstly, he needs to select several bright stars which he could use to guide him in the right direction (preferably, stars with a magnitude of 1 or less). The lower the star is to the horizon, the better it is to indicate direction so his next step is to calculate the azimuth of the chosen stars when they rise and set from his latitude of 50oN. He doesn’t have time to observe and memorise the directions of the stars as the South Sea Islanders did so he allows himself the luxury of a nautical almanac to help him with this task.The following table shows the data that Jerry collected to help him to construct his star compass. Notes: 1. To make his calculations of azimuth, he uses the method explained here). 2.To calculate the azimuth of a star when it is on or just above the horizon, Jerry uses an LHA of approximately 271o for dawn and 089o for dusk. (The method of calculating a star’s LHA is shown at step 1 here). 3. Bearings of the Sun at sunrise and sunset are included in the table but only for the equinoxes and the solstices since these are the only four dates on which we can be sure of the Sun’s declination without the aid of an almanac. This information is not included in Jerry’s star compass on this occasion because he will be making the voyage in August. Below is a diagram of the star compass that Jerry constructed. Because he wants to steer an easterly course, he has selected stars that rise between northeast and southeast and set between northwest and southwest. The North Star (Polaris) and Kochab in Ursa Minor (Little Dipper) are also shown to help him find the direction of north. 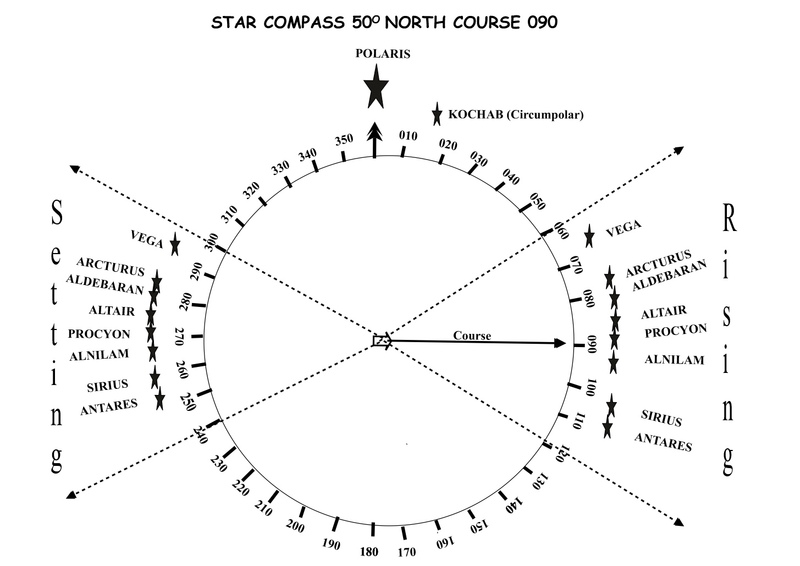 Additional Links: Star Compass 1, Survival Astro Navigation Predicting rising and setting times of stars, Locating the North Star, What is Astro navigation? This entry was posted in astro navigation, Astro Navigation Demystified, Astro Navigation Topics, astronomy, celestial navigation, earth science and tagged astro navigation, astronomy, celestial navigation, navigation, survival. Bookmark the permalink.